The new Australian Open champion Caroline Wozniacki tried to estimate how many times she had been asked about her lack of Grand Slam titles. Wozniacki thought for a second. Then, completely straight-faced, she concluded: "Probably 100,000." Everyone in tennis - with the exception of poor Simona Halep - can be relieved that Wozniacki has finally broken her hoodoo. Because this story has been retold so many times that the pages of the book were coming loose. Until Saturday, Wozniacki always resembled the successful TV actor who never quite made it in Hollywood. She would grind out results at the lesser events with her fleet-footed, hugely consistent game. But then - as soon as she arrived in Melbourne, Paris, London or New York - the big hitters would barge her off the stage. In the absence of any change in the on-court narrative, the conversation around Wozniacki used to focus on the trimmings. The close friendship with Serena Williams. The romantic links to star athletes Rory McIlroy and David Lee. The 3hr 26min finish in the 2014 New York marathon. And the modelling shoots that she posted weekly on her social-media feed. Now, at last, it is time to talk tennis again. 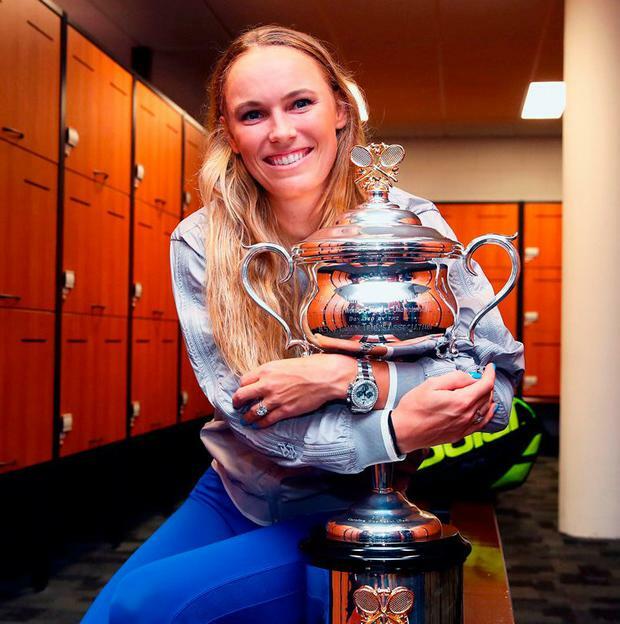 In her 43rd major tournament, Wozniacki climbed to another level. She served faster than at any time in her life, moved like a panther and directed her backhand down the line so precisely that it might have come equipped with a laser-guidance system. Not even the punishing heat and humidity - which left Halep so dehydrated that she spent four hours in hospital afterward - could derail her. For Wozniacki, the relief was palpable. "It's really nice to prove people wrong who doubted me," she said. Was there anybody in particular she was thinking of? "Definitely the press. No offence!" Rather than basking in her triumph, the Dane is already on her way to this week's WTA Premier event in St Petersburg. Her work ethic has always been phenomenal. In fact, her critics used to say she spent too much time chasing points and profits, which then affected her form at the Grand Slams. Wozniacki, unsurprisingly, has never seen it like that. Wozniacki also emphasised the contribution of her father Piotr, who has tried to step back from his role as her primary coach on a number of occasions, but could never bring himself to stay away for long. "It's just extra special that when I started playing tennis at seven years old he was there, whether it was raining or whether it was hot," she said. "When I was 10, we would be training at 10 or 11pm." It will be interesting to see where Wozniacki goes from here. Having reclaimed the world No 1 ranking for the first time in six years, she will not be overlooked in the build-up to slams any more. She argues she will feel lighter and freer now that the monkey is off her back.